LAS VEGAS (AP) — Oregon's bid to win four games in four days hit a big snag in the second half of the Pac-12 tournament semifinals. Arizona State looked fresh, the Ducks tired and their best rim protector was on the bench in foul trouble. Digging deep into their fortitude, the Ducks not only mustered the energy to break out of their funk, they rallied to win in overtime. Do it one more time and they'll be headed back to the NCAA Tournament. 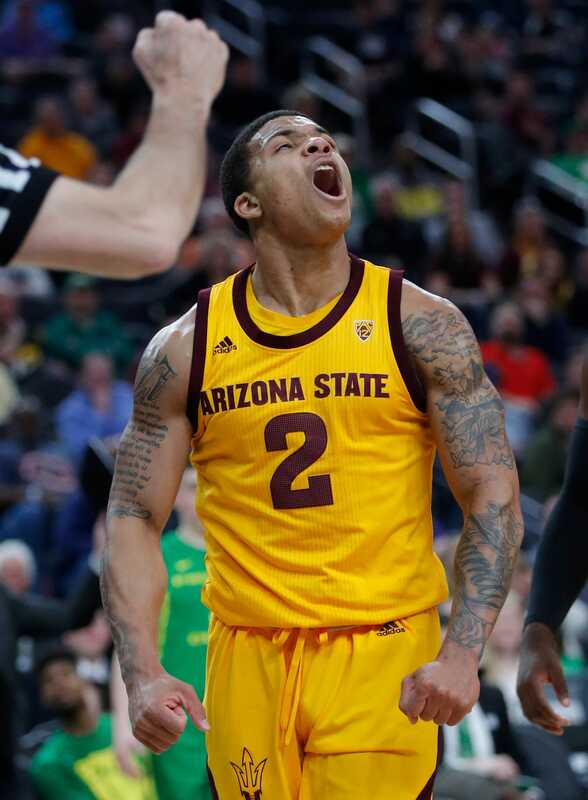 Louis King scored 19 points, Payton Pritchard added 18 and Oregon outlasted Arizona State 79-75 on Friday night in the Pac-12 semifinals. "The adrenaline carried us through to the finish line," said Oregon's Paul White, who had 14 points. "I think everyone was not worrying about it themselves or anything. We just wanted to get the win for the team." Bracketology: Can Florida State Pull Off Another Surprise? 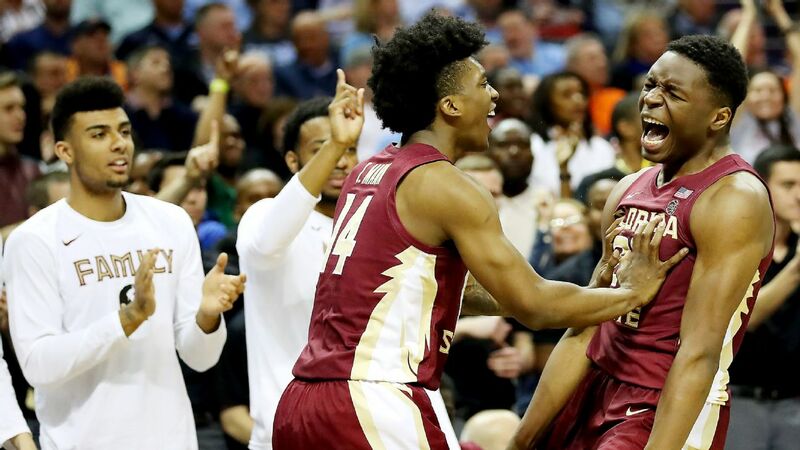 Florida State takes on Duke Saturday in the ACC tournament final, after upsetting No. 1 seed Virginia. 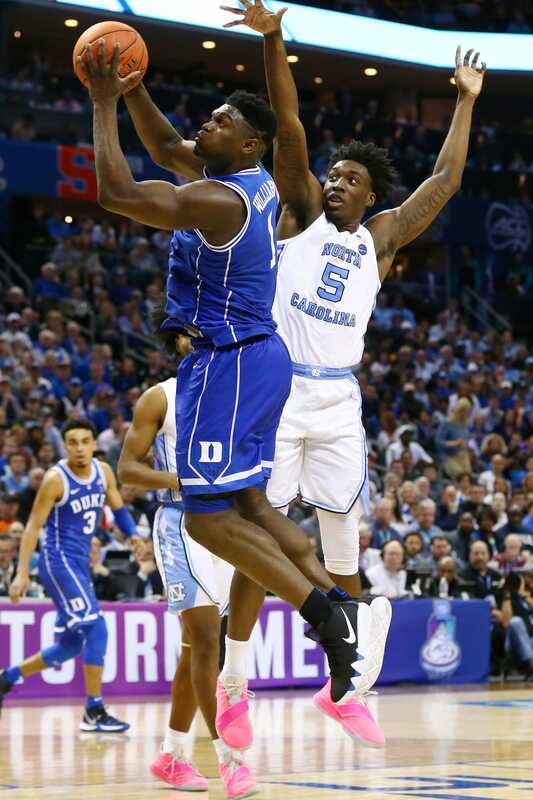 After Friday's thriller that featured a healthy Zion Williamson, we can only hope that Duke and North Carolina will meet again in the NCAA tournament. CHARLOTTE — Consider this a plea to the basketball gods, a prayer to the cosmic keepers of The Bracket. Three times seeing Duke-North Carolina this season is not enough. Over the many years of your tournament in its various forms and field sizes, never have we had an opportunity to see these two great Tobacco Road rivals play in a Final Four. In an event that has given us everything from the randomness of VCU-Butler to the unbridled heat of Louisville-Kentucky, it’s high time we get a chance to see Duke-North Carolina playing for everything. So why not now — or, more specifically, three weeks from now in Minneapolis? If it’s anything like Friday, when Duke held on for a 74-73 victory in the ACC tournament semifinals, it is more than worthy of your consideration. But as Williamson’s put-back off his own miss gave Duke the lead for the final time with 31 seconds left and North Carolina forward Cam Johnson couldn’t make a hurried jumper as time ran out, it felt like there was still some unfinished business. Duke can say it might have won either or both of the first two meetings against North Carolina had Williamson not been forced out with a knee injury. North Carolina can say it might have swept three in a row had it not suffered an uncharacteristically poor 4-for-27 shooting performance from the 3-point line. Of all the years North Carolina and Duke have played each other while both were highly ranked, this season as much as any feels like we need to see it one more time to get the final word. You could argue he might have made more had Duke committed to ensuring Williamson touched the ball on every possession, which probably would have been a good idea considering he made 13-of-19 field goals for 31 points and was too strong and agile for North Carolina’s bigs to guard him the post. Duke, being the young team that it is, did not maximize that advantage. Over the final nine minutes, Williamson made 4-of-6 field goals, while his teammates made just 1-of-9, not to mention R.J. Barrett missed two free throws with 12 seconds remaining that handed North Carolina guard Coby White a chance to win it (he didn’t, missing a desperate 3-pointer). James Harden (41 points, 9 rebounds, 11 assists, 6 steals and 3 blocks) became the first player since steals and blocks were first tracked in 1973-74 to record 40+ points, 10+ assists, 5+ steals and 3+ blocks in a single game as he led the Rockets to a 108-102 victory over the Suns tonight in Houston. Harden now has 25 40-point games this season, the third-most in the last 50 seasons, behind Michael Jordan (37 in 1986-87) and Kobe Bryant (27 in 2006-07). Devin Booker led the Suns with 29 points, 5 rebounds and 7 assists in the losing effort. With the win, the Rockets improve to 43-26, while the Suns fall to 16-54 on the season. Final scores can be deceiving, and the result of Friday's game in Miami stands as a prime example. Milwaukee Bucks forward Giannis Antetokounmpo posted 33 points, 16 rebounds and nine assists as his team overcame a 20-point halftime deficit to defeat the Miami Heat 113-98 at AmericanAirlines Arena. Per ESPN.com, the Bucks tied a franchise record with the largest second-half comeback in franchise history. Milwaukee dug itself a massive first-quarter h*** and trailed 37-19 after 12 minutes. The Bucks stopped the bleeding in the second quarter but still couldn't cut into the Heat's edge. However, that all changed in the third quarter, when the Bucks engineered a ferocious comeback to crawl within one point. Milwaukee kept its foot on the gas in the fourth, outscoring the Heat 34-18.